What gardener hasn't wished they had a couple of season extenders hidden up their sleeve? If you live north of the Mason-Dixon Line, you probably have a fairly short growing season. Ours is officially 5 months in NE Ohio, May 15th to October 15th. Of course being good gardeners, we like to push it whenever we can. There are a number of ways that you can do this depending on how much time, effort and money you want to spend. Here are some ideas from easy and inexpensive to the more involved and costly. We'll talk about greenhouses and cold frames on another page. 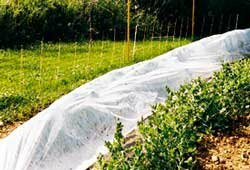 Plastic tarps are basic season extenders that provide protection from light frosts . Any of them will work as long as you are careful not to put too much weight on young tender plants. We have used the ubiquitous blue tarps, and rolls of clear plastic. If you are going to use the clear plastic, we recommend 4 mil or heavier, it's just easier to work with. When using plastic tarps, it's important to remember that they need to be taken off in the morning as soon as the temperatures permit, even on a cool day the heat can build up quickly under the tarp. The tarps also need to be anchored down with bricks or rocks to keep the wind from blowing them around. Some folks like to use "hats" made out of newspapers. These are similar to cloches which have been widely used by market gardeners in Europe for years. The traditional cloche is made of glass and is bell-like in appearance; the name is actually French for bell. The newspaper hats are made the way you used to make them when you were a child by folding them into a triangular shape. If it's not too windy, they can just be placed over the plant, or you can anchor them with stakes or small branches. Another way to make your own cloches is to use empty milk jugs or two liter soda bottles. Simply cut the bottom off of the jug and press it lightly into the soil around the plants. Leave the cap end open for ventilation. There are also variations on the cloche theme made of Styrofoam, wax paper, and plastic. There is one style that has plastic "cells" that can be filled with water. The theory is that the water absorbs heat from the sun during the daylight hours and releases it at night. The nice thing about these is that they are open at the top so they won't overheat if you forget to take them off during the day. Other season extenders such as row covers made of spun-bonded polyethylene work well although the material can be expensive. This product can serve double duty after the danger of frost is over. Many people use them to protect their crops from insects. This product can be especially useful on crops such as cabbage and broccoli to protect them from cabbage loopers and other bugs that like to munch on them. The material allows sunlight, water, and air to pass through. It's probably not a good idea to use them on crops that need pollinators, however. Hoop houses or row tunnels are season extenders that can be used in conjunction with tarps and spun-bonded polyethylene to create miniature greenhouses. The hoops can be made from almost any material that is substantial enough to support the weight of the cover and to stand up to wind. PVC pipe in the ½" or ¾" size is a popular choice for this. It's flexible, easy to find, and relatively inexpensive. The hoops can be formed by sticking the ends into the soil on both sides of the bed, attaching pipe straps to the sides of your raised bed, or using metal re-bar stakes that the pipe ends will fit over. Hoops can also be made from wood in any dimension that you have lying around if you prefer. The above warning about overheating applies to row covers made of clear plastic; they need to be ventilated during the day so that you don't cook your veggies before their time.